It’s a sunny winter’s morning on the campus of Dartmouth’s Geisel School of Medicine, and two groups of students from nearby Lebanon and Hartford High Schools fill a classroom in Geisel’s Remsen Hall. Accompanied by Ryan Gambero, a science teacher from Hartford H.S., and Will Connell, an English and social studies teacher from Lebanon H.S., each group is there to take advantage of an experiential learning opportunity called Upper Valley STEM (Science, Technology, Engineering, and Mathematics) Scholars. 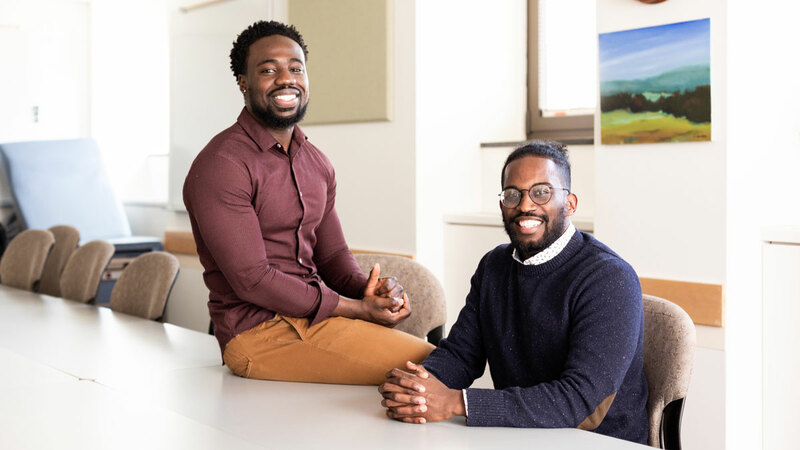 The collaborative project is led by Geisel students and Schweitzer Fellows Shuaibu Ali ’21 and Kenny Williams ’21, in partnership with the teachers and their Geisel classmates Laura Herrera Gomez ’21 and Carlos Aramayo ’21. “One of our main goals is to engage you, through some different STEM activities and through mentorship, so that you’ll see some of the career options that are available to you in STEM fields like medicine,” Ali tells the students. A recent community needs assessment has shown that in the Upper Valley—with employers like Dartmouth College, Dartmouth-Hitchcock, Hypertherm, and the Cold Regions Research and Engineering Laboratory in close proximity—demand for workers in STEM-related fields is on the rise. On this day, the groups are visiting Geisel’s anatomy lab to learn first-hand about different aspects of human anatomy and disease processes by viewing the bodies of program donors. The high school students start with an “ice-breaker” exercise before hearing about another important goal of the project. Lebanon High School students (left to right) Klaleh Punni, Weati Punni, and Lorraine Zaki interact with Carlos Aramayo '21 in Geisel's anatomy lab, as part of the Upper Valley STEM Scholars program. A series of racially charged events have recently occurred at Lebanon High School, which has prompted students, teachers, and school administrators to ask for help from the community. People of color from across the Dartmouth campuses have responded—by making regular visits to the school to offer their support to those who feel victimized, and by expanding the scope of projects like Upper Valley STEM Scholars. 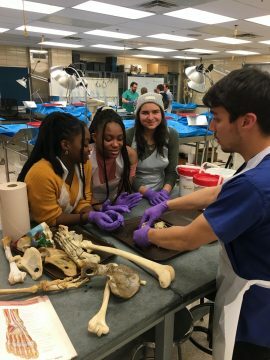 During their visit to the anatomy lab—guided by the medical students and James Reed, who runs the lab and directs Geisel’s anatomic gifts program—the students are fully engaged, interacting easily with one another and asking questions as they rotate through four different anatomical stations. Later, the medical students—who share similar backgrounds as people of color and those who were raised in lower income households—offer some thoughts about their project. “By exposing the students to different facets of medicine, listening to them and sharing some of our own experiences, we hope that they’ll feel validated and more empowered about their future, whether that ends up being in medicine or another field,” says Aramayo. This spring, the four are offering workshops at both Geisel and Dartmouth-Hitchcock Medical Center that show the students examples of human physiology and disease, clinical interventions and treatments, and how societal issues, such as poverty and racial status, impact the health of communities.